This Walnut Chest-on-Stand is featured in the "Current Work" section of the October 2004 issue of Fine Woodworking Magazine. This piece was built for a show of my work at the Main Street Gallery in Annapolis, MD. 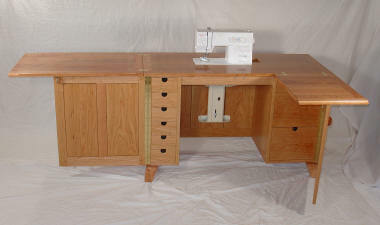 Before and after pictures of a sewing table work center, custom made for a Bernina sewing machine. To make a sewing table, start with a stack of carefully selected Cherry boards cut out of rough lumber. Cut the pieces to final dimension, and join with mortise and tenon joints and hand cut dovetails. Book-matched highly figured Curly Maple and Walnut. This chest of drawers has been sold from the MAIN STREET GALLERY in Annapolis, MD. It is on it's way to Muncie, Indiana. Behind the book-matched doors you will find five lined drawers with dividers, suitable for storing jewelry in fine style. The Curly Maple door panels are framed by Black Walnut, with Walnut casework, legs and rails. Hand cut dovetails join the drawer fronts to solid hard maple drawer sides. Fashioned from a 2' wide plank of thick Walnut, which was cut out of the tree with the bark still on the edges of the board. This solid Cherry dining table, shown closed, opens to nearly 12' long with the addition of three leaves. Built on commission for the Prat's family, who set a table for 10 each night, this table was fashioned from a single log of thick, wide boards of highly figured American Cherry wood. Built on commission for Charlie Daneri and Emily Williams, these tall cabinets were custom made to fit around an existing fireplace. Built in frame and panel style from a single log of Cherry, it fits well in their comfortable home. It was a lot of fun to work with Charlie and Emily on their project. "Working with Michael and Karen has been a real joy. Their work is exquisite, their ideas are enlightening and their friendship is invaluable. Throughout this project, Michael and Karen have provided guidance and support. The end result is better than we ever expected. Thanks to both of you." 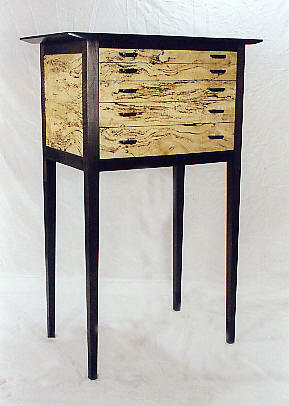 I built this chest of drawers for the MAIN STREET GALLERY in Annapolis, MD (301-652-8678). It features five lined drawers, suitable for storing jewelry, clothing, or silverware in fine style. The Spalted Maple drawer fronts and cabinet sides are framed by black walnut legs and rails. Hand cut dovetails join the curved drawer fronts to solid hard maple drawer sides. 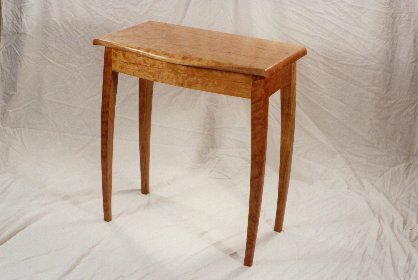 A bow-front table in Walnut for Mike and Ellen Johnson. The bowed top, curved drawer fronts and tapered legs are being cut out of a spectacular log of rare Curly Walnut. 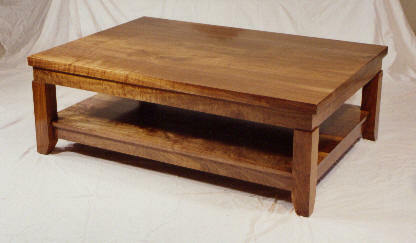 A simple hall table in Cherry features through-tenons that show in the top of the table. The tenons are wedged with a pair of Walnut wedges for an ornamental effect to a structural element. The Cherry top shows a dark streak of heartwood bordered by the light sapwood typical of Cherry wood under the bark. A bit of bark shows along the edge of the board. 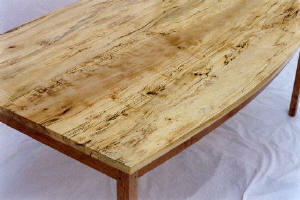 A Spalted maple table was delivered to Rockville, MD. Cherry legs hold up the bow sided top. After seeing the new table in place, Debbie and Chris have asked me to build a set of six chairs to sit around the table. 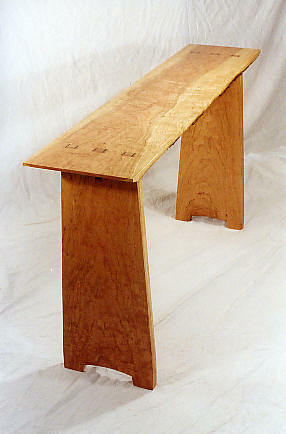 A Birdseye Maple table top sits on a trestle base of Cherry with Maple slats. Shown with one of two leaves, this table collapses into a 48" round dining table to seat 4.